In the fall of 1975, ABC and executive producer Roone Arledge took a bold step by creating a prime time variety series and installing sportscaster Howard Cosell as the host. With this show, ABC hoped to recapture the magic of the classic Ed Sullivan Show. At the time, Cosell was one of the most recognizable personalities in the media industry. In 1970, ABC launched Monday Night Football and inserted Cosell into the broadcast booth. This package revolutionized the way TV networks treated prime time and Cosell was a key factor in its success. He was a polarizing figure who was never afraid to voice strong opinions. 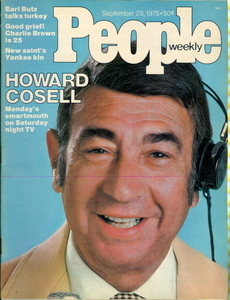 While many viewers despised the controversial Cosell, they would tune in to hear what Howard might have to say, and that worked well for Arledge. Cosell had also branched into the entertainment arena via guest appearances on TV sitcoms such as The Odd Couple and in movies like Woody Allen's Bananas. He was frequently cast as himself in these roles. Arledge felt that he could capitalize on the notoriety of Cosell and use the new variety show to boost ABC's entertainment ratings. This promotional clip provides insight into the ambitious expectations ABC had for the show. It also illustrates the pomposity of the one-and-only Cosell. Cosell had many connections and believed this would enable the variety show to attract the top names in entertainment. Howard actually thought he could convince The Beatles to reunite on his opening show. He approached John Lennon with this idea, but Lennon turned him down. ABC titled the 60-minute show Saturday Night Live with Howard Cosell and debuted it on 9/20/1975. ABC televised this series live (but showed it on tape delay on the west coast to fit it into the prime time schedule). It originated each Saturday night at 8 pm ET from the Ed Sullivan Theater in Manhattan. Leading up to the premiere, ABC heavily promoted the show both on the network and with large ads in major newspapers. ABC specifically hyped the live entertainment angle as most other variety shows of the era were taped and edited for later airing. ABC would also cross-promote the variety show on the Monday NFL games and have Cosell plug the upcoming football game during the Saturday show. A September issue of People magazine previewed the new show and questioned whether it would succeed. ABC booked the shows with a mix of Hollywood stars, musicians, comedians, circus performers, and sports celebrities. The series utilized a regular comedy trio of Bill Murray, Brian Doyle-Murray, and Christopher Guest which ABC billed as the Prime Time Players. Cosell was so nervous before the opening show that he wanted cue cards for backup despite the fact that he was legendary for doing his daily radio commentaries without notes or a script. That initial episode included Frank Sinatra, John Denver, Paul Anka, Shirley Bassey, Jimmy Connors, and the cast of The Wiz. It also featured two live remotes. one from London (just after 1 AM local time) with The Bay City Rollers rock band and another from Las Vegas of a Siegfried and Roy illusion act with lions. Media reviews for the debut were mediocre at best. On the second show, Cosell conducted live interviews with Muhammad Ali and Joe Frazier a few days before their epic boxing match in Manila. The live nature of the show led to some problems. On the 10/25 show, an Evel Knievel segment ran long so the producers determined that singing group Labelle would only have time for one song rather than the two they were promised. Upon learning this, the group refused to take the stage which forced Cosell to fill time roaming the audience. Unfortunately for ABC, this series flopped in the ratings and received many negative reviews from newspaper critics. In the 10/9 Chicago Tribune, columnist Gary Deeb claimed to have information from "inside sources at ABC" that the cancellation of the show was a "foregone conclusion". At that point, ABC had only aired three episodes. On 11/26, just over two months into the run, ABC officially cancelled the show, but announced that it would stay on the air through mid-January. Overall, ABC produced 15 live episodes and three reruns over 18 weeks. Don Mischer who directed the variety show recently did an interview looking back at his experience with Cosell and Arledge. He commented on the haphazard nature of booking live entertainment such as the night Arledge contacted Lionel Hampton about an hour before air time and slotted him into the show. That same season, NBC launched a late night live series on 10/11/1975 called NBC's Saturday Night which aired at 11:30 pm ET. Unlike the ABC show, the NBC version proved successful and remains on TV. NBC termed their comedy team the Not Ready for Prime Time Players as a takeoff on the name ABC used. NBC would eventually adopt the name Saturday Night Live for its show. 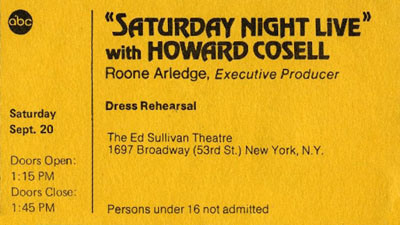 On 4/13/1985, Cosell hosted an episode of Saturday Night Live on NBC. In the opening monologue, he reflected back on his ABC variety show in typical Cosell style. This post is part of a Classic TV Variety Show Blogathon. Check out the great content on the other participating classic TV blogs. I was never really into sports, but.. I do remember my dad watching, the very recognizable sportscaster on, Saturday Night Live with Howard Cosell. While I was sitting in my room doing homework. Wow.. that took me back in time. Thanks for the comments. I actually didn't watch much of the variety show, but had fun researching it. I remember sampling this show a few times. Today, when I mention there was a SATURDAY NIGHT LIVE with Howard Cosell as host, people looks at me like I'm crazy. They think I mean NBC's SATURDAY NIGHT LIVE with Cosell as a guest host! (Of course, as you correctly pointed out, NBC retitled its late night show). While Cosell was highly successful doing football and boxing, I always thought he was an odd choice for a variety show host. But I can see why Arledge thought it would work. And, honestly, Ed Sullivan wasn't the liveliest of variety hosts, either. Very interesting post and the clips are great! Thanks for the comments. I was hoping to also supplement the videos with a clip of the actual show, but never found one... Arledge would often think "outside the box". In subsequent years, ABC used Cosell on shows such as Battle of the Network Stars. Jeff, this show was on during what I like to call my "wilderness" period, when I was living in an area that didn't have a full-time ABC affiliate, so it was a show I'd only read about in TV Guide but never saw. Roone must have felt he could make a hit out of anything! Thanks for bringing this back into the spotlight. Wow, it must have been frustrating to not have a full-time affiliate for one of the big 3 networks back in the day. I grew up in the NYC market so I never had that problem. I appreciate the comments. Hi. WOW! I remember Cosell clearly as he was an unforgettable character and presence on TV. I've also seen the Muhammad Ali and Joe Frazier interview many times, but I didn't remember Cosell had a variety show at all. Great stuff. Thanks for kind words. In my opinion, one of Cosell's greatest strengths was conducting interviews. I attended the 10/25/1975 dress rehearsal. The show appeared to be slapped together. I recall a musical performing group called LaBelle was introduced. The curtain went up and the audience applauded. The group stood there in their lavish attire for a good 15 seconds looking at each other in silence until the music kicked on. It was as if someone forgot to turn up the volume and 15 seconds into the song remembered to turn it up. There was no back-up band. The music then went off and the curtain dropped as the girls walked about. The curtain knocked a head piece off of one the performers heads. It was almost as if someone wanted to take it from the top but failed to tell the group. The group was announced again, the curtain went up and again no music. The music then started again, went off and the curtain came back down. The curtain went up for a third time and the audience began booing the group. I believe LaBelle performed one song and that was it. Keep in mind this group was Top Female Group (single and album), Top Female Disco Group (single) and Top Single Record (group). They were hot for that period. I watched the show live that night and LaBelle was never aired. I later heard a dispute erupted and they walked away after the rehearsal. I certainly could see why. That "dress rehearsal" needed a dress rehearsal. It appeared to operating on a wing and a prayer run by amateurs. Thanks Jeff K for the great info on that dress rehearsal. I was on the Howard Cossell show on 11/29. I was the pedal steel player for Doug "The Rajun Cajun" Kershaw. We had a great time doing the show. Awesome! Did you get to meet Cosell? A high school drill team from Houston Texas was also on the show on November 29th. We were known as The Westchester wranglerettes and we and our marching band were in New York City to be in the Macy's Thanksgiving Day Parade. Congrats! Awesome to hear from another guest who appeared on the show. Thanks for the info, Mary Ellen. My dad worked the spotlight for the show. My dad brought the family down on 10/18 to see Evel Knievel and he sat with my family for about a hr and talked. Then when the show was filming I was sitting on the isle seat and Ali was standing right over me waiting to be announced and he looked down at me and put his fist up against my face. Just so crazy to think of what a day I had at 11 years old!